New York University professor and filmmaker from Mali, Manthia Diawara, analyzes visual anthropology within the work of Jean Rouch. The film consists of an engaging dialogue between post-colonial francophone Africa and its previous oppressor, France. Commonly, viewers are subjected to a European perspective, providing a distant gaze into African culture, objectifying Africans or perhaps othering this community. 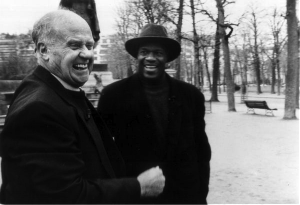 This film, however, reverses this relationship through an examination of the life and works of ethnographic filmmaker Jean Rouch. Rouch discusses the state of contemporary Franco-African society from a uniquely African perspective. Rouch also discusses his body of work as well as his general outlook on life with passion and honesty. Diawara and Rouch speak with great intrigue throughout the course of Rouch in Reverse. Fischer, Michael M.J. Film ReviewsAmerican Anthropologist 99.1 (1997): 140. Academic Search Premier. Web. 27 Apr. 2014. Gray, Christopher. “Film Reviews.” American Historical Review 103.1 (1998): 311. Academic Search Premier. Web. 27 Apr. 2014. Harrow, Kenneth W. “Manthia Diawara’s Rouch In Reverse: An Interstitial Perspective.” Critical Arts: A South-North Journal Of Cultural & Media Studies 13.1 (1999): 40. Academic Search Premier. Web. 27 Apr. 2014. Keaton, Trica D. “We Won’t Budge: An African Exile In The World.” African Studies Review 46.3 (2003): 175-176. Academic Search Premier. Web. 27 Apr. 2014. Livia, Anna. “Everyone Would Rather Be In Paris.” Visual Anthropology 16.4 (2003): 393-406. Academic Search Premier. Web. 27 Apr. 2014. Petty, Sheila. “African Film: New Forms Of Aesthetics And Politics.” African Arts 44.4 (2011): 94-95. Academic Search Premier. Web. 27 Apr. 2014. Samuels, Adrienne P., et al. “From The Motherland.” Ebony 63.6 (2008): 112-118. Academic Search Premier. Web. 27 Apr. 2014. Sangudi, Genevieve, and Ruthie Epstein. “An Interview With Manthia Diawara.” Journal Of International Affairs 57.2 (2004): 119-126. Academic Search Premier. Web. 27 Apr. 2014. Tchouaffé, Olivier Jean. “We Won’t Budge: An African Exile In The World.” Velvet Light Trap: A Critical Journal Of Film & Television 55 (2005): 71-72. Academic Search Premier. Web. 27 Apr. 2014.